Product reviews, styling & photography, social media promotion, giveaways, event coverage, speaking engagements, botanical stylings, workshops, company/shop visits, capsule collections. Previous clients include: IKEA, Pinterest, Urban Outfitters and Zalando as well as many smaller brands and talented artists. Urban Jungle Bloggers has been featured in Monocle, Trend Tablet, The Times, Better Homes & Gardens, Freunde von Freunden, Living Argentina, T magazine (NY Times), NYLON, die Zeit, Architectural Digest and more. Urban Jungle Bloggers™ started in 2013 when we met over coffee in Paris chatting about favorite blog topics, like interiors, travels and greens. We soon realised that we share a common love for houseplants and decided to turn this into a monthly blog series on our own blogs. We called it Urban Jungle Bloggers. From the first month, our blog readers loved it and fellow bloggers asked to join in and in the next months, dozens of bloggers joined and a global community of plant lovers was born. Knowledge was shared, inspiring DIY’s were featured, styling tips exchanged. New blogposts were gathered on the Urban Jungle Bloggers website and via Facebook, Pinterest and Twitter. The community kept growing and the #urbanjunglebloggers hashtag on Instagram quickly became one of the most popular houseplant-related hashtags. 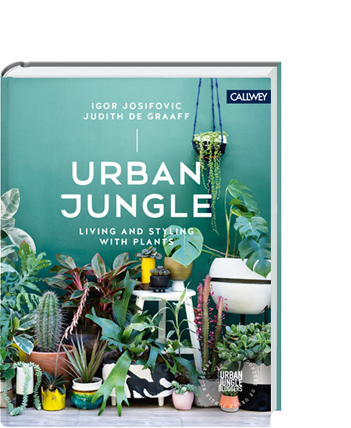 In January 2016, we started a new project: our first book called Urban Jungle, living and styling with plants. We decided to document the process and highlights from our green community via our new @urbanjungleblog account on Instagram. Twice a day we share the most inspiring photos tagged with #urbanjunglebloggers. In September 2016 we launched the new book in both English and German. It sold out in a week and is currently in its 7th edition and has been translated in several other languages (French, Dutch, Czech, …). Igor Josifovic (1978) is a blogger, social media expert and plant lover living between Munich and Paris. He shares his love for interior design, travel and living with plants on his Happy Interior Blog. Judith de Graaff (1980) is a blogger, graphic designer and plant lover, living just outside Paris. She shares her love for colour, design, travel and living with plants on her blog JOELIX.com. No plant or project is exactly the same, so to find the best way to work together and create something exciting, get in touch with us and let’s get the conversation started. You can reach us by email at hello (at) urbanjunglebloggers.com or use our contact form.